The Smok OSUB King 220W TC Starter Kit is a new and improved OSUB sub ohm vaporizer that sports the same ergonomic and compact shape but with dual 18650 cells for an increased output range maxing out at 220W! This OSUB series vaporizer now comes equipped with the TFV8 Big Baby Sub Ohm Tank for the same great performance but with an upgraded 5mL tank capacity for all day vaping. With this edition to the OSUB series you will enjoy the same stealth C-Shaped Lateral firing key as the original as well as a side panel OLED display screen but now with the cutting-edge puff monitoring system for ultimate control over your vape. 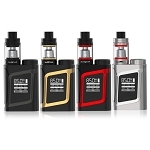 Please note the Smok OSUB King 220W TC Starter Kit requires two 18650 batteries that do not come included with the vaporizer. If you need to purchase these items please select the Add 2 x 18650 Batteries option above, if you have any questions about these items feel free to contact our customer service line during normal business hours for assistance.